Welcome, LB31. The NFL will see you now. We have all experienced a long wait at the doctor’s office and the emotions that come with it. The frustration with the time it takes the doctor to get to the room, the uncertainty of what may happen during your examination, the fear at what your test results may show and the nagging doubt that you may not understand your diagnosis or know the right questions to ask to set your mind at ease. Now, multiply that experience 32 times and go through it with 15-60 others who are interviewing for the same unbelievably competitive job as you. Do it knowing you may be asked to undergo multiple x-rays and MRI tests and answer questions from doctors you have never met about every injury you have ever had – and others you may not realize you have. And do it with the understanding that you may never learn the results of any of the medical tests you take. It’s all part of the NFL Scouting Combine experience for the 330+ college prospects hoping to get drafted in April. The NFL Network and ESPN have brought much of the combine into our living rooms in recent years. Video clips of the bench press and three cone drill and live feeds of position specific drills are watched by millions of fans looking for a glimpse of their team’s next draft class. But the combine’s original purpose was to bring all the draft-eligible prospects together for a medical evaluation and examination. Though it’s evolved into a four day process filled with interviews, psychological testing and position workouts, the medical exam is still arguably the most important part of combine for an NFL scouting department. On the day they arrive, each player picks up his registration packet and the process begins. 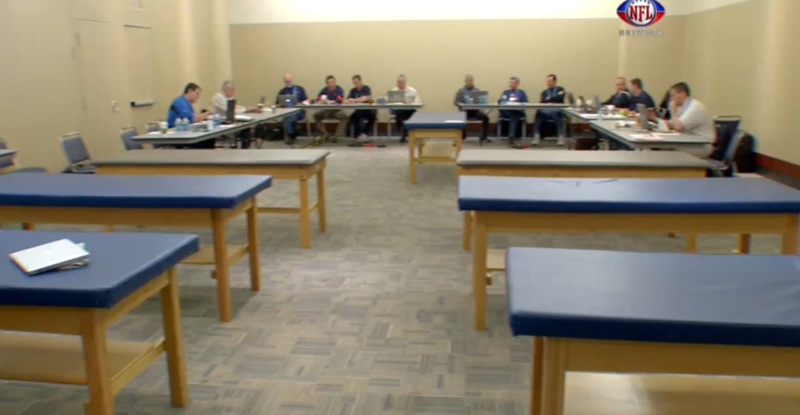 All 32 teams already have an extensive medical history provided to them, but every player takes an intake exam on their first day in Indianapolis. He’ll also have x-rays, an MRI, ultrasound studies, or a variety of other imaging procedures to re-evaluate any past injuries, a treadmill stress test, blood work, a urine drug screen, and vision, hearing and dental screenings. On his second day, a player runs a gauntlet of medical and orthopedic exams. The NFL has changed the process over time, but here’s what a typical examination day may look like for a player. It’s based on internet reports from physicians, agents, an NFL video released in 2011 and conversations I have had with players with similar experiences. **Register and pick up your checklist for the day. You will be going through multiple stations with a loose schedule, so you are given a checklist to be signed off at each station so you don’t miss any. You will also want to have any additional medical history and imaging studies you have brought to Indianapolis in hand to share with the doctors at each station. **Go to the medical station for an evaluation. Though the bone, joint and muscle evaluations are the primary focus of the day, you will visit one medical station where a team will ask you general medical questions. They will ask you about your family history and any past medical problems you have had – like asthma or a hospitalization for an infection you had when you were in grade school. They have reviewed your blood work and other screening tests and may ask questions about a worry they have but of which you are not yet aware. **Go to the first of 4-6 orthopedic stations. Each of these stations holds the orthopedic and training staff of 5-6 NFL teams. Here you’ll be taken into an exam room by one team and thoroughly examined. Every joint or muscle injury you have ever had will be scrutinized to the smallest detail. If you had a prior ACL injury, doctors will push and pull on your joint to determine its stability. They’ll test the strength of the surrounding muscles on the Cybex machine. They’ll review all your past images, including those you had yesterday, to look at the appearance of your graft and repair. If you had a prior bony injury and the x-rays you had yesterday are not clear, you may have yet another set of x-rays taken today. The exam room: Just one of the hurdles a combine invitee faces this week. After your first exam at the station is summarized, each team’s orthopedic and training staff will ask you questions and examine you. They may also request additional imaging studies and tests. **Go to the next orthopedic station. You’ll repeat the above process at each orthopedic station – possibly 3-5 times – until you have been examined and evaluated by all 32 teams. When you’re finished, unless your evaluation has discovered a serious or life-threatening condition, you won’t know whether you have failed the examination portion of any exam. None of the teams will share their opinion on the shoulder you injured a few months back or tell you what they think of the knee MRI you had while in Indianapolis. All 330+ players will take the same medical journey on the second day at the combine. On average, each team’s medical, orthopedic and training staff will evaluate 80 or more players on each day of the four day evaluation period. 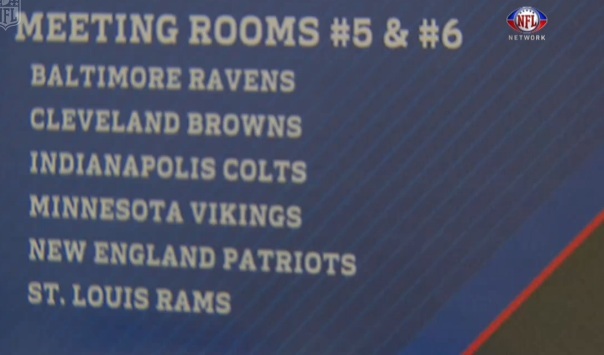 The medical grade given to each player on a team’s draft board will largely be based on this process, though teams may ask a player to come back to Indianapolis the following week for another examination and often do another examination at a player’s Pro Day workout. It’s a brutal, intimidating and often frustrating experience. Though the NFL has improved the system in recent years, it’s still an interview process. Teams want as much timely medical information on their personnel investment as they can get and they want to collect it themselves. It’s not patient friendly. It’s the Combine.